NASA’s satellite imaging states that the mass of phytoplankton plants has been reducing by 1% year on year over the last 20 years. Research by Dalhousie University, published in NATURE, confirms a reduction of more than 40% during the last 50 years (Up to 2012). Given that plankton provide more than 70% of our oxygen and remove most of our carbon dioxide, this is BAD news. Over the next 25 years we will have lost 75% of all plankton, the oceans will become more acidic, and the ecosystems will crash. We will lose most of the whales, seals, birds and the fish, and along with them a food supply for billions of people. Life on Earth is going to change, in fact life on earth may become impossible. It doesn’t take science to tell you we cannot survive without healthy oceans, common sense tells us we need to stop poisoning them with toxic chemicals and plastic. If we had not killed more than 50% of the plankton with toxic chemicals since the chemical revolution during the 1950’s, then we would not have had elevated CO2 and climate change. Every other breath you take comes from the world’s oceans. In fact, the science indicates that 70% of the planet’s oxygen is generated by plankton. The microscopic plants and animals, drifting throughout the oceans, use photosynthesis to generate oxygen and remove carbon dioxide from our atmosphere. They are the basis of our food chain and the lungs of the planet. Quite simply, plankton is the foundation of our existence, and all life on Earth depends upon plankton. Over 10,000 tonnes of sunscreen gets dumped on corals each year. At 62 parts per trillion it is highly toxic to coral and plankton. The GOES Foundation is taking urgent action to lead the essential sea change needed to restore plankton levels and it is this action that can address ocean acidification and global warming. We’re a team of thinking, breathing, well-connected human beings and we believe it is possible to prevent a catastrophic collapse of our life on earth, but we need to take decisive action over the next 10 years or it will be too late. we can accelerate the recovery of the plankton, health of the oceans and start absorbing more carbon dioxide out from the atmosphere. Universal sea change requires global engagement. AND it’s easy for you to help. 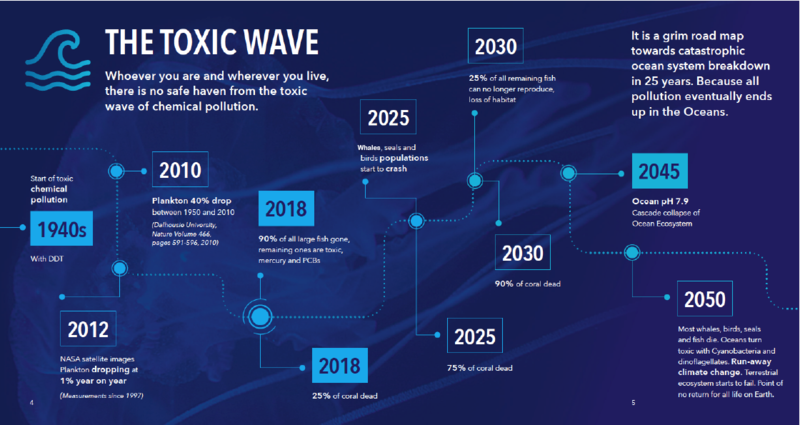 Whether you’re in a position of influence, sailing the oceans or you are simply eager to change a few bad buying habits and protect the world you live in, it’s time to change — go non-toxic! Because all freshwater pollution eventually ends up in the oceans. When it comes to the failing health of our planet, the prevailing focus has been increasing carbon dioxide levels from burning of fossil fuels. It is important to reduce carbon emissions, but we must also eliminate toxic chemical pollution. The oceans are the lungs of the planet but since the Chemical Revolution in the 1950’s and the production of herbicides and pesticides, the oceans are suffocating under a toxic chemical cocktail. Marine toxic chemicals are in every type of household cleaner and personal care product. The world now manufactures thousands of different toxic chemicals that are killing the plankton and halting their ability to produce oxygen and remove carbon dioxide from the atmosphere. It is the GOES team’s strongest held belief that If we had not poisoned the oceans, we could have prevented climate change. It’s absolutely and completely impossible to overestimate the importance of photosynthesis in the maintenance and now delicate balance of life on Earth. We are all witness to the lose of phytoplankton, the decline in oxygen production and the well published CO2 increase — our oceans are already more acidic and climate change is accelerating at a much faster rate than previously predicted. We must restore our oceans. It’s not just about saving whales and dolphins – WE cannot survive if we keep poisoning them. If we don’t address this, they’ll become too acidic and we’ll witness a cascade failure of the wider planetary ecosystem. Terrestrial life on earth will become impossible unless you have an oxygen tank on your back! At the current rates of decline, we will reach this tipping point any time in the next 25 years. It will happen quickly, be impossible to reverse, and we will have run-away climate change and mass starvation on a global scale, unless we act now. The GOES Foundation is taking urgent action to lead the essential and universal sea change needed to address climate change. We are working worldwide to hold back the toxic wave that is poisoning our oceans. GOES engages people and organizations at every level of society, from children to world leaders and intrepid adventurers who help by sailing over the oceans at high and low latitudes to collect our plankton samples. GOES uses all the digital technology and AI tools it can to demonstrate the need for the urgent ban of all toxic chemicals, hazardous waste and plastics from households and industry. We should really just take a precautionary approach, or a reality check and just stop using highly toxic chemicals. GOES will endeavour to collect thousands of samples to provide indisputable evidence to help policy makers accelerate their decision making and help get these chemicals out of our lives. The GOES Global Oceanic Environmental Survey is our practical and immediate response to the often financially, logistically challenging scientific surveys. By harnessing the ocean-loving enthusiasm of the international sailing community and providing them with plankton sampling kits, GOES will collect thousands of vitally important samples of plankton from remote places all around the globe. Through public awareness and easy access educational and learning resources, GOES inspires, mobilises and supports adults and children to change the way they live, and to choose the least toxic products to eat, clean or use in the shower. GOES exists to communicate the urgent need for a change in the global procurement and use of ocean toxic chemicals at every level of society. By engaging with key players in industry, government, science, media and education, we equip those who can make industrial and social change with the information they need to make informed decisions. It is the ocean sailors around the globe who traverse the open seas who make the GOES project utterly unique. They are at the heart of our research community and their contribution to the GOES metadata which will inform us on the presence of specific persistent chemicals. The GOES team have a huge breadth and depth of knowledge and practical experience and expertise encompassing all aspects of the science and its real-world application, from the environmental to the social, economic and the political. 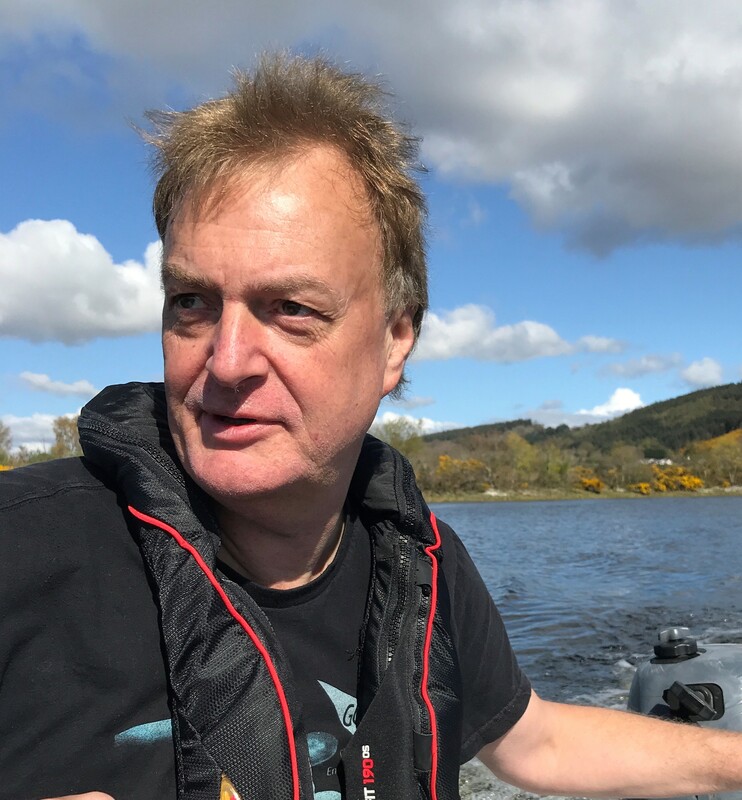 Leading, internationally acclaimed marine biologist, Dr Howard Dryden, takes the helm as Chief Scientific Officer of GOES. As an academic and successful business man, Howard’s 30+ year career has been focused on one vision — to make the aquatic environment safer and cleaner for humans and all the other organisms on which our life depends. Dr. Dryden has exceptional knowledge and experience of combining biology, chemistry and physical sciences and their application to the real world impact of chemical pollution. His work ranges across every aspect from the supply of safe clean drinking water to fish farming, industrial wastewater management and large-scale environmental disaster control. When he isn’t working, advising on water policy or speaking at conferences around the world, Howard is sailing its coastal and open oceans! Howard, along with his team of marine biologists, and an experienced globally-connected group of policy makers, communication experts and management consultants are the driving force behind GOES. Alongside those who work with us, GOES will mobilise its ethical, scientific, economic and political influence to create ecologically sustainable, healthy oceans.